Along the Sea of Japan. 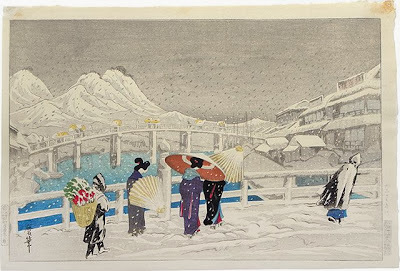 The Sanin Region 山陰地方.
. Lafcadio Hearn, Koizumi Yakumo 小泉八雲 . The Japanese soba, a buckwheat noodle, is usually divided into "Shinshu soba," popular in the eastern part of the country and "Izumo soba," popular in the western part. Another difference resides in the serving style. 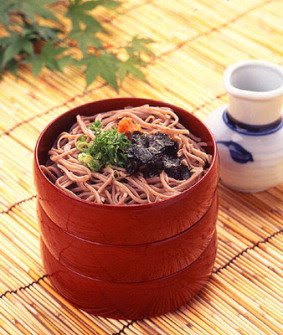 Izumo soba is served in stacked bowls called warigo. Condiments like sliced onion, grated radish, red pepper or dry seaweed are first put directly on the soba in the bowls and the soba soup, tsuyu, is then poured over it. Without other desire, laugh loudly. Fumai means, not to take things tooo seriously, not to cling to material things. His Buddhist name was Myooan. He revived the Matsue domain through the production of iron goods and used the money to improve his collection of tea utensils. He founded a new school of tea with fewer rules and more to enjoy for the townspeople and later for the rich folk of the finance world. There are now some green powder tea brands named after him: Aoi-jirushi Ichi no Shiro and Aoi-jirushi Naka no Shiro. Every year there is a great tea ceremony party at the castle of Matsue. The poeple of Shimane have a great culture of drinking matcha powdered green tea on an every-day basis. Special tea ceremony sweets are also produced in Matsue until today. Kanazawa with the Maeda clan (Kaga) is also famous for its regional tea culture and sweets in the Ishikawa prefecture. The Izumo region is a famous producer of menoo めのう (瑪瑙) , 出雲めのう agate stone. Many are formed into ritual magatama jewels for the imperial family. Izumo is an old name for the Matsue region of Shimane prefecture, and where the well known tea expert "Fumaikou Matsudaira" comes from. This area is also known for the wide variety of tea cakes. Botebote cha was the tea widely loved by the people in Izumo before the World war II began. To make "botebote cha", make the coarse tea, then pour into the cup which is the color of transparent yellow, then take a chasen (whisk), put some salt at the edge and whisk the tea. And then put some cooked black beans, red colored rice, chopped pickles into the foamed tea, and eat. "Shirifuri cha" is very similar to "Botebote cha" except the way to eat. To have shirifuri cha, you don't use chop sticks to eat the things inside the tea, you just have to thought of throw the food from the cup into your mouth. Origins of the "botebote cha" is said when people were suffering from starvation, Fumaiko Matsudaira told people to mix food and tea like this. That way they can satisfy with even little food they eat, and tea gives energy. Also in Oshima region in Yamaguchi prefecture, it is said that origins of tea porridge is when Lord of Mr. Yoshikawa moved from Iwakuni from Sekigahara told people this idea for saving rice during the hardship of the economy. This kind of stories exists at many regions in Japan, and it is just a way to tell people that this way of eating does not look or sounds very good; however it has such a venerable story with it. This interesting way of using tea must not started by particular person, and was started by people who live there. Botebotecha is a one way to use tea for other than just drinking. Many richer people have a tea room in their home where they serve this kind of "tea" to their visitors. The ingredients are arrenged on a special plate and each person can take some of his liking. All visitors carry a special high tea cup and a whisk to prepare their own. The sound of strongly whisking the tea until it gets a white froth is the sound of "bote bote bote". another speciality is the sencha green tea drunk from very small cups, like little sake cups. The whole plant with the sheath and stems is put through a cutter various times, then all is roasted and made into a delicious tea.
. Tsuwano Town Festivals 津和野 . from the Tsuwano 津和野 region. made from sato-imo 里芋 which grow in the vulcanic soil of this area. ita wakame, itawakame 板わかめ "dried wakame like a sheet"
They are carefully prepared by hand, dried a full day in the sun on the beach. Most are done by small family enterprizes. Father goes fishing for them and the wife and daughter dry them. In Izumo, when the "Gods are present" (now celebrated in October). kami aisai 神在祭（かみありさい）, when all the Gods of Japan come to the shrine of Izumo to celebrate after the harvest. The official reading is zenzai ぜんざい. サルトイリバラの葉 leaves, found in the Izumo area. Usually they are wrapped in kashiwa leaves. Maitake are grown in 飯南町 Iinanchoo. for the Girls Festival (hinamatsuri), weddings and other celebrations. Mostly a miso soup, but some families put it in a clear soup. Speciality of lake Shinjiko, where in the brackwater a lot of these shells are harvested. They are a large black variety, yamato shijimi ヤマトシジミ. （スズキ suzuki sea bass、ウナギ unagi eel、コイkoi carp、シラウオshirauo whitebait、アマサギ amasagi smelt、モロゲエビ moroge ebi prawns、シジミ shijimi). suzuki is a typical fish of the lake Shinjiko 宍道湖 in Izumo, already mentioned in the Ancient Legends of Izumo. Once a fisherman fried this fish for himself when the lord of the area, Matsudaira, passed by and asked for a try. The fisherman did not want to hand it over just like that and warpped it into the paper first, simmered it for a while and then the lord ate it with great pleasure. It became the special food for the lord and local fishermen were not allowed to eat it, until the Meiji restauration. uruka is a method of soaking food in water until it is very soft. shark meat contains a lot of ammonium substances and keeps without refrigerating for a while. It was a source of protein for mountain regions, where they could prepare it as sashimi. From Shimane to Hiroshima mountain regions. yakuzen ryoori 薬膳料理 "food as medicine"
. Izumo Taisha 出雲大社 Izumo Grand Shrine . ***** . Folk Toys from Shimane . people who were deliberately buried alive inside large-scale construction projects -- have circulated in Japan since ancient times. Most often associated with castles, levees and bridges, these old legends are based on ancient beliefs that a more stable and durable structure could be achieved by sealing people inside the walls or foundation as an offering to the gods. 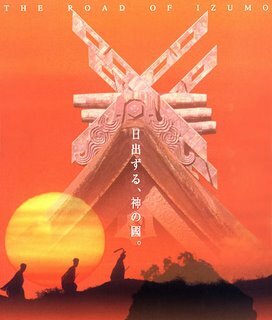 hitobashira 人柱 human sacrifice, "human pillar"
MATSUE CASTLE HAS BEEN MADE A NATIONAL TREASURE!! It was announced just last night, (May 15, 2015) that Matsue Castle in Shimane Prefecture has been designated a National Treasure! Matsue Castle now joins Inuyama Castle in Aichi Prefecture, Matsumoto Castle in Nagano Prefecture, Himeji Castle in Hyogo Prefecture and Hikone Castle in Shiga Prefecture as the 5th castle keep to be awarded the prestigious title. Girls are not allowed to dance in the streets of Matsue City. If they do, the base of the city’s symbol, Matsue Castle, will begin to shake, endangering the ancient building. The story goes that Matsue Castle’s Ishigaki contains a Hitobashira, a human sacrifice, entombed in the stonework to act as a guardian spirit of the castle. In this case, the Hitobashira was a young girl who loved to dance, and so to appease her spirit and prevent the castle from shaking, a law was passed preventing girls from dancing in the street. Up there with Matsumoto Castle, Nagoya Castle and the tiny Asuke Castle in Aichi Prefecture, another of my favorite castles would have to be Matsue Castle in Shimane Prefecture! Also known as Chidori-Jo, it is one of the 12 keeps remaining in original condition. Matsue is superb!